Cupping is a method of stimulating acupuncture points by applying suction through a glass jar, in which a partial vacuum has been created. The reduced pressure within the cups draws the skin up into it. 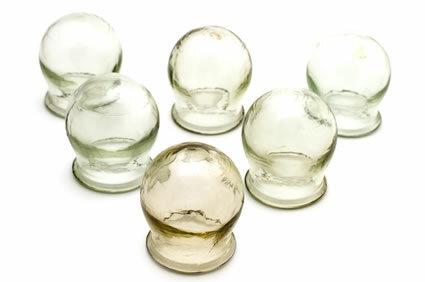 Cupping is a highly effective treatment for reducing pain or congestion. People often notice an immediate difference after treatment. Cupping affects the body’s tissue up to four inches deep and is thought to be the best form of deep tissue massage available. And is a method which is safe and reliable for most people. The suction or vacuum required for cupping is most commonly created by a flame (heat) or pump. In TCM it is used to warm the qi (Chi), to clear the dampness from the body, and reduce stagnation and swelling. In TCM theory, cupping therapy can open up the meridian channels which have become blocked through stagnation and therefore enable the life energy to flow freely throughout the body and through all organs and tissues. Cupping helps pull the blood out of the area to the to be dispersed, making room for fresh, oxygenated, nutrient-rich blood. It can replenish the tissues and accelerate the healing process. It draws stagnant qi from deep within to the surface to be released, so easing pain. treat coughs and tightness or congestion in the chest. musculoskeletal pain, (low backache, sprains, soft tissue injuries). Commonly static cups are left in place for five to 15 minutes, and when removed, they usually leave a round red bruise behind. Bruising occurs in spots where congestion existed.